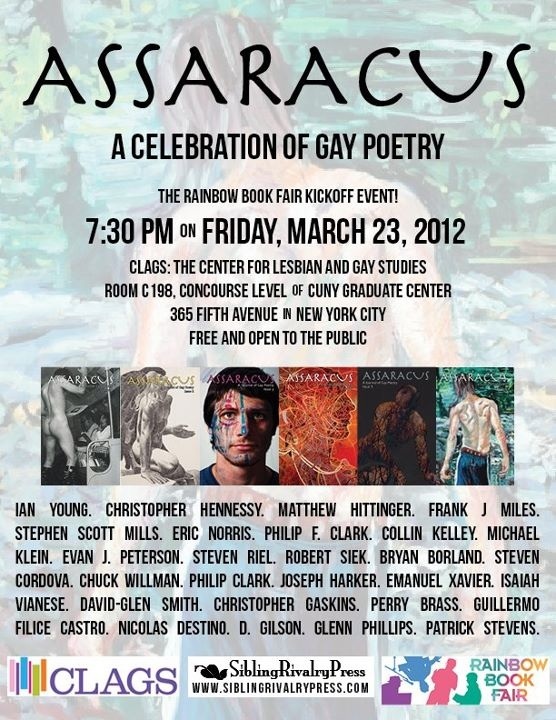 On March 23, 2012, the night before the Rainbow Book Fair, CLAGS (The Center for Lesbian and Gay Studies) and Sibling Rivalry Press present Assaracus: A Celebration of Gay Poetry. For the first time, poets from the first six issues of Assaracus: A Journal of Gay Poetry—the world’s only print journal dedicated to the gay poet—will read together, legend alongside rising, established next to emerging. Assaracus was created in the spirit of community and brotherhood. Assaracus: A Celebration of Gay Poetry will showcase those themes through the collective voices some of gay poetry’s brightest contemporary writers—in one place, at one time. The night will also feature the launch of Assaracus, Issue 06 (featuring cover art by Seth Ruggles Hiler) and include remarks on gay publishing and poetry from Ian Young, groundbreaking founder of Catalyst Press and editor of The Male Muse, an early, daring, and important anthology of gay poets. Come kick off Rainbow Book Fair weekend with the Assaracus poets. Featuring Christopher Hennessy, Matthew Hittinger, Frank J Miles, Stephen Scott Mills, Eric Norris, Philip F. Clark, Collin Kelley, Michael Klein, Evan J. Peterson, Steven Riel, Robert Siek, Bryan Borland, Steven Cordova, Chuck Willman, Philip Clark, Joseph Harker, Emanuel Xavier, Isaiah Vianese, David-Glen Smith, Christopher Gaskins, Perry Brass, Guillermo Filice Castro, Nicolas Destino, D. Gilson, Glenn Phillips, Patrick Stevens, and remarks by Ian Young. For more about Assaracus, visit www.siblingrivalrypress.com.